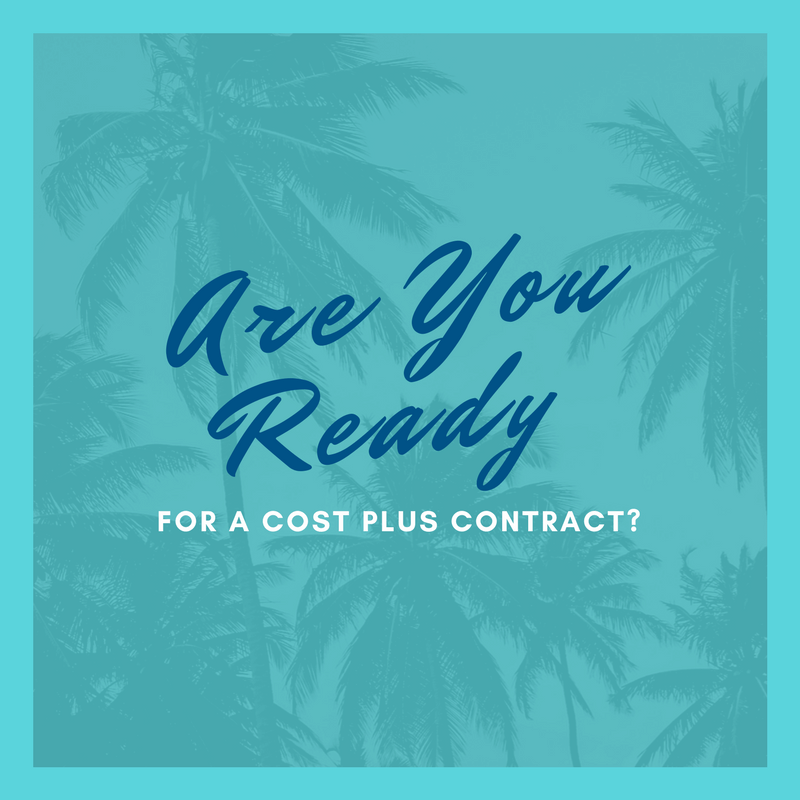 Are You Ready for a Cost Plus Contract? If you are a small business ready to grow in federal contracting, going after Cost Plus Contracts may be your next step. Up to now, you’ve only gone after Fixed Price and T&M. What new issues should you consider in the Cost Plus world? Managing indirect rates is critical to maximizing the profitability of the contract. If you overrun your actual indirect rates, not only will you use up more of the contract value that was planned for program activities, but you may run out of authorized fee pool, reducing overall profit. You may be required to submit an Incurred Cost Submission certifying your actual indirect rates six months after the end of your fiscal year. Check your contract for FAR 52.216-7 clause for Allowable Cost and Payment. The Incurred Cost Submission, also called Incurred Cost Electronically (ICE), has over 20 spreadsheet schedules with detail of your actual indirect rate pools and bases and summaries of your actual contracts, subcontracts and billings. Provisional Billing rates should be submitted to DCAA annually at the beginning of your fiscal year. Once you have estimated your rates for the upcoming fiscal year, send a letter to your cognizant DCAA auditor stating your provisional indirect rates. You should receive a letter back from DCAA acknowledging the provisional rates. You can update your rates during the year if necessary. DCAA will typically verify receipt of a properly completed ICE, but may not audit it for several years. While DCAA has taken action to clear the backlog of Incurred Cost audits, they may not perform your ICE audit for several years. For small businesses, they have started a program where they may audit your first ICE and then just write an approval letter for subsequent approval, if they have determined the audit risk is low. Issue adjusting billings at the end of your fiscal year for your best estimate of actual indirect rates. This billing is frequently referred to as an Indirect Rate Variance voucher. Your first year may have indirect costs that are not as low as the indirect costs that you bid. You never have control over the timing of the award and the ramp-up time for the contract. If the contract starts in the 8 month of your fiscal year, it will bring down the indirect rate rates for that fiscal year, but not as low as the overall rates you planned in the proposal (which may have intended that the contract start in the 4 month of your fiscal year.) Be sure to discuss this with your contracting office and let them know where you expect to be on indirect rates, since funding may be affected. Track your billings by month, fiscal year and contract year. In order to provide the information needed for the ICE, you will need to keep data showing each billing and the totals for the fiscal year, either in your accounting system or in a spreadsheet. Be prepared to compare your actual indirect rates and report the difference between indirect costs billed and indirect costs applied at actual. Some Cost Plus Contracts have indirect rate ceilings. An indirect rate ceiling is a maximum value for an indirect rate. The most common type of ceiling is a maximum rate for G&A. Some Cost Plus Contracts have exceptions to applying fee. Check your contract and how the fee pool is stated. A Fixed Fee pool may require delivery of hours or technical hours. In this case, you may only be able to apply fee based on labor costs, and not travel and other direct costs. Some Cost Plus Contracts use a Subs Handling Fee or don’t allow Fee to be applied to Subcontractors. These rules will be part of the structure of the bid – be sure that your billing department has this information. Cost Plus Contracts are typically incrementally funded. Funding Modifications will be issued to cover three to six months of funding. You’ll need to track cost and billing and notify your contracting officer when you are at 75% to 85% of funding. Track your Authorized and Funded Contract Value split into Cost and Fee, including by Base and Option Years. Plan ahead on how to set up charging and tracking in your accounting system to provide reporting and billing by your fiscal year and the contract year. If you are a subcontractor on a Cost Plus contract, be sure you understand the contract and terms. Even if you prepare and submit an ICE, your prime contractor does not have access to your indirect rates. You will need to submit a variance voucher each fiscal year – don’t let it “roll over” to the end of the contract. Winning a Cost Plus contract is a positive milestone – just be sure that you review the contract issues, ask lots of questions and discuss with others who have experience with the customer.